Easter is few days away and its time you start on those preparations. This holiday is an awesome time to plan fun creative activities with your children. If you choose the right things to do, you will get their complete attention and interest. The further Easter crafts for children ideas, are perfect for spending time with your children and having fun at the same time. This is one of the easy Easter crafts ideas that is fun to make. Bunnies, they are so fluffy and cute and everybody loves them. But the most beloved of all is, the easter bunny. Why? Because he brings presents to children, so why not make it even more exciting for them and make their own cute bunny mask. This idea is very easy and quick to make, and it is very cheap. All you will need is two paper plates, glue, cotton balls, pink paper, scissors and stapler. First cut the middle of one plate, that use the second one to make the bunny ears.Cut smaller ear shapes out of the pink paper and glue it on the ears. Staple the ears and the elastic behind the paper plate. Put glue all around the edge of the front of the plate and add cotton balls, all of the circle. Let the glue to dry, and your mask is ready for play. 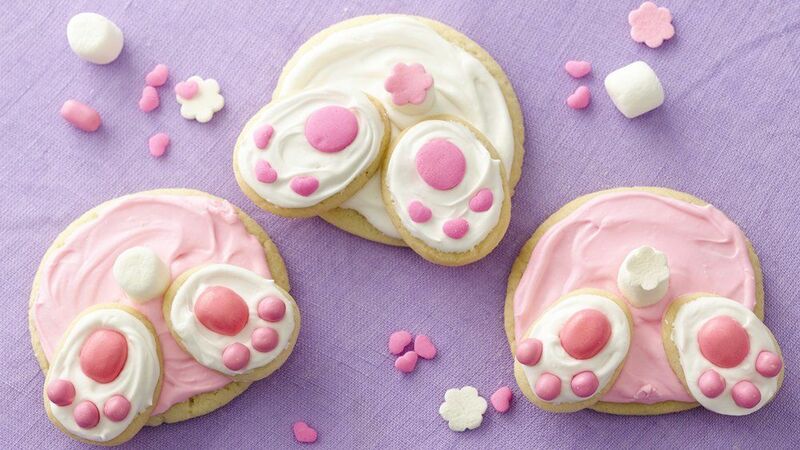 This cookies call for a cuteness alert, as they are to die for and so easy to make. If you don’t feel like baking, you don’t even have to.Just buy your favourite cookies, bigger and smaller ones and decorate them. Just make your frosting, add to it pink gel food color, mix them well. Take one piece of the big cookie and frost it, add on it two smaller cookies, to make the bunny legs and frost them as well. For the bunny’s tale, use tiny marshmallows and decorate the was of the bunny with pink assorted sized candies. This has to be one of the cutest Easter craft ideas for kids. How fun does this sound. Everybody loves the minions and would want the, around anytime. An Easter craft idea on how you can make your kid happy and open his creativity. For starters use egg paint and make all the eggs yellow. Let them cool down. Then you will need blue paint,(what kids use to paint their drawings), black electrical tape and small google eyes. First, make the bottom half of the eggs blue. Cut a small line of black tape and place it around the “head of the minion. Glue the google eyes on it, as you wish, one or two. You can use a black marker to draw some hair on their head. If you need, you can keep in front of you a picture with minions to get it right. If you don’t wanna use black tape or google eyes, you can just use a black marker to draw the face. Have fun! Does this sound to weird…or messy to do? Well, make a mess and no one gets angry, this is what kids really want to hear. But this is not just any kind of mess, its a beautiful mess. You will need some eggs and more colors of paint. Take a white canvas and place it against a wall. Crack the top of the eggs and pour out the yolk and white. Fill the eggs with paint and thats it. The fun can begin! Throw the eggs at the white canvas to create a modern “work of art”. To much fun to handle. This easter crafting idea for kids is strictly a job for a child. They will have tons of fun doing this, even though it might get messy. So make sure you set for them a place where they can go crazy. Take a paper plate and tell you kids to color the back of the plate. Then, take a white piece of paper, and put the bottom of the plate on it, two times, on under another. Here comes the super fun part. Now your kids have to use the same shade and color the bottom of their feet. After that, they have to step on the paper with the circles two times, one time to use their footprints to make the bunny ears and one time to make the paws of the bunny. Add the final touch to make the eyes, nose, whiskers and mouth of the bunny and you are done. No need to spend a lot of money on Easter egg decoration. Call your children and tell them to bring their Crayola crayons along. Boil the eggs and put them in an egg box. While they are hot start colouring them with crayola colors. The heat will melt the waxy crayons and will serve as a perfect canvas. Just let your imagination run wild. Another super easy and cute idea to craft for Easter with your children. You only need a few things and you are ready to start. Get a paper plate, cotton balls, glue,google eyes and grey paper. Take the paper plate and glue on all its surface cotton balls to make the fur of the lamb. Then, the a scissor and make the head, ears and legs of the lamb. Glue the head and ears on top of the cotton balls and the legs behind the plate. Add the google eyes on the face, and voila! Your kid should be pretty proud for making this all alone. 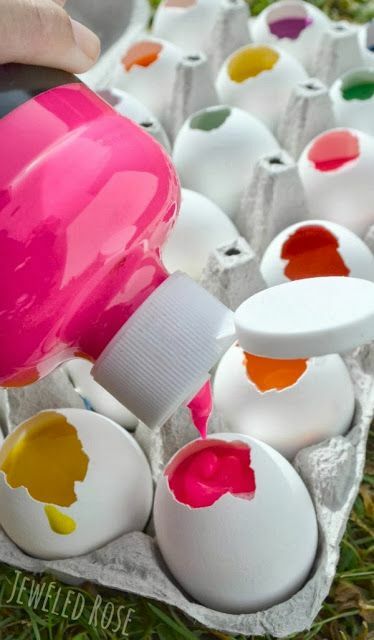 If you are one of this parents who are into dying eggs with their children, then you should find this easter crafting exciting. You will need some rice, vinegar, food colouring, cookie wax paper and glue. Take the rice and mix it every rice cup with one or two tablespoons of vinegar. Add the food colouring of choice in a bag , add the rice, seal the bag and shake it well. Take a sheet of cookie wax paper, draw a big egg on it and let you kids do their thing. They should cover all the paper with glue and glue the rice on it,a s they wish. 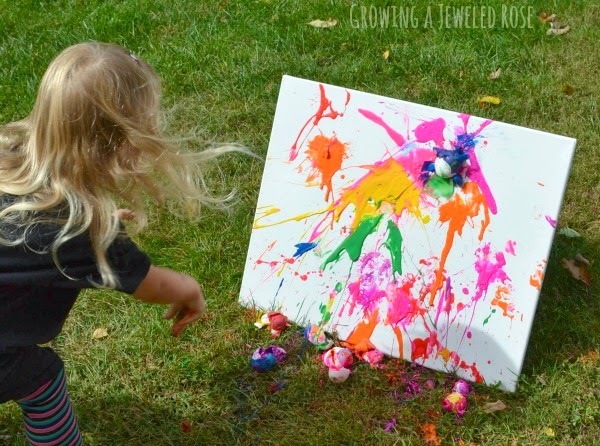 There is no child that will say no to this easter craft ideas for kids. Its an active and creative way for kids to spend their time. Take a big piece of paper or a piece of white cloth, lets say 1×1 metres and some colouring paint. Kids should color the bottom of their feet in yellow and make foot prints on the paper or cloth.After that, use black to make the legs and eyes of the chicken, and orange for the peak., or you can use google eyes. This should make a cheerful decoration for the children’s room for Easter. That’s, right, you can make your own unique and colourful Easter vase together with your children. You will need a sponge, a balloon, confetti,Mod Podge and a vase. Blow up the balloon, and place it with its bottom inside the vase. Add Mod Podge with the sponge on top of the ballon and glue the confetti on it. Add as many as you can, on half of the ballon. Let the glue dry properly and then, give a pin to your kid and ask her/him to pop the ballon. You will be left with a confetti bowl looking recipient. Tale some scissors and cut the edges of the bowl straight. You can use it to put the Easter eggs inside, or whatever your heart desires.